The Brazzaville Foundation held its annual dinner attended by Trustees, Advisory Board Members and a number of Friends of the Foundation at the Royal Automobile Club on 4 April. This was followed by the Advisory Board meeting on 5 April. Jean-Yves Ollivier, the Chairman, and Sir David Richmond, the Chief Executive, would like to thank the Advisory Board members for an excellent and productive meeting. Mr Xavier-Guerrand Hermès has had to step down as an Advisory Board member for health reasons. On behalf of the Foundation, the Chairman, Mr Jean-Yves Ollivier, expressed both his sadness at this news and his gratitude for the very generous contribution that Xavier Guerrand Hermès has made during his time as an Advisory Board member. On 30-31 January Sir David Richmond, CEO of the Brazzaville Fondation, had the honour of meeting in Kigali Dr Diane Gashumba, the Health Minister of Rwanda and Mr Charles Karangwa, the acting Director of the Food and Drugs Authority. They discussed the organisation of a major conference in Kigali later this year to address the problem of substandard and falsified medicines in Africa. Sir David Richmond will meet the acting Director General of the Rwandan Food and Drugs Authority in Kigali on Wednesday 30 January. They will discuss the fight against falsified and sustandard medicines in Africa. Interfax - Russian Deputy FM Boganov, international NGO head discuss Libya settlement. Lord Bell stepped down as a trustee of the Foundation on 9 November for health reasons. The Chairman has thanked him for all his work for the Foundation and especially his help in getting the Foundation up-and-running. The Brazzaville Foundation is pleased to announce that the United Nations Development Program (UNDP) has launched a call for tender for the Prefiguration study of the Congo Basin Blue Fund. Another milestone on the path to preserving the Congo Bassin. The Brazzaville Foundation was honoured to be invited to participate in the 2018 Rhodes Forum organised by the Dialogue of Civilizations Research Institute. In a panel which included the former Malian President Dioncounda Traoré and the former Guinean Prime Minister Ibrahima Kassory Fofana, our Chairman, Mr Jean-Yves Ollivier, took the opportunity to talk about the role of private sector and foundations in promoting inter-cultural dialogue. He also shared his views concerning the relationship between the African continent and the rest of the world. He argued that governance in Africa should not be based on Western models: African countries should be able to find their own paths based on their own realities and traditions. "Discover the work of our Advisory Board Members Sundeep Waslekar and Ilmas Futehally"
On Wednesday May 23rd, in conjunction with the 71st World Health Assembly, the "Medicines We Can Trust" conference will be held. The Brazzaville Foundation is a partner of this event aiming to promote the right to effective medicines for all. One in ten of the world's medicines is of poor quality, poorly manufactured or counterfeit. This alarming phenomenon gravely affects people’s health, especially in poorer regions of the world, erodes citizens’ faith in their health systems and may even threaten states’ security as the criminal economy underlying fake drug trafficking worsens. While the 71st General Assembly of the World Health Organization (WHO) is being held this week in Geneva, the Brazzaville Foundation, alongside other organizations such as the Harvard Global Health Institute, is proud in supporting the “Medicines We Can Trust” initiative launched by the United States Pharmacopeia (U.S.P). This conference, organized on Wednesday, May 23rd in conjunction with the General Assembly, will bring together the leading experts on this topic at the international level to develop new ideas and a shared plan of actions for addressing this global crisis. It is of the utmost urgency that the international community tackle this international public issue: the fight against substandard or counterfeit medicines requires the cooperation of all states – and not only those of the most affected regions, namely Africa or South-East Asia – to strengthen control over drug regulation, to detect fake drugs, to enforce laws and sanctions in a context of internationalized trafficking, and to increase awareness among patients and the broader public. The "Medicines We Can Trust" initiative is aimed at proposing possible solutions for eradicating these toxic substances from the lives of the most vulnerable. By joining forces with the US Pharmacopeia, the Brazzaville Foundation seeks to build on its previous work in the African continent, where health and socio-economic development have been most heavily hit by falsified and substandard medicines. We have launched several advocacy initiatives to strengthen international and transnational coordination against this threat. Most recently, a conference organized on March 28th in London by the Brazzaville Foundation, in partnership with Harvard University's Global Health Institute, brought together health experts and government representatives around the table to exchange views on public health hazards caused by the proliferation of falsified and substandard medicines and on the solutions to curb this problem. We are pleased to reaffirm our commitment to ensuring quality in treatment for those all around the world. Mustapha Niasse, President of the National Assembly of Senegal, presents his approach of the meeting between Libyan opponents, organized by the Brazzaville Foundation in Dakar, Senegal. Jean-Yves Ollivier, founder and chairman of the Brazzaville Foundation, explains what motivated him to arrange a meeting between Libyan opponents in Dakar, Senegal, on 11-13 May 2018. More than two dozen Libyans drawn from all parts of the political spectrum and representing both civil and political society are meeting in Dakar, Senegal on 11-13 May. This will be an opportunity for Libyans representing a wide range of views and interests, including long-standing opponents, to meet, many for the first time, and to talk to each other without intermediaries or outside interference. The meeting, which has been in preparation for several months, has been organised by the Brazzaville Foundation with the support of President Macky Sall of Senegal. But the Foundation will not be taking part in this dialogue which will be exclusively between Libyans. Among those taking part are members of the February and September movements. The Heads of State and Government of the Congo Basin Climate Commission meeting in Brazzaville on 29 March 2018 have decided to appoint HRH Princess Lalla Hasnaa, President of the Mohammed VI Foundation for the Protection of the Environment, Mrs Maria De Fatima Jardim, Angola’s Minister of the Environment, Mr. Lokua Kanza, Musician Artist, and Mr. Jean-Yves Ollivier, Chairman of the Brazzaville Foundation, as Goodwill Ambassadors for the Congo Basin Blue Fund. The Brazzaville Foundation is honoured to have this opportunity to support all the countries who have signed the Memorandum of Understanding (MoU) on the creation of the Blue Fund, including several new countries, and to work closely with them to make the Fund a reality. The Advisory Board members and some Friends of the Brazzaville Foundation met in London on 19 and 20 April 2018. A dinner in honour of the Foundation was held on 19 April at the Royal Automobile Club in the presence of our Patron, HRH Prince Michael of Kent. Advisory Board members, trustees and several Friends of the Foundation were present. The guest of honour was the distinguished Algerian diplomat, Said Djinnit, the UN Secretary General’s Special Representative for the Great Lakes. Jean-Yves Ollivier, the Chairman of the Foundation, and Sir David Richmond, the Chief Executive, would like to thank them for what they thought was an excellent and productive meeting. The Foundation has made tremendous progress and we are now pursuing four or five very worthwhile and potentially high profile initiatives. Their support and advice are invaluable. The Foundation is particularly grateful that several members of the Advisory Board have kindly agreed to take an active part in some of those initiatives. The Brazzaville Foundation, in partnership with the Harvard Global Health Institute and the London School of Hygiene and Tropical Medicine (LSHTM), held a highly successful conference on the issue of substandard and falsified medicines at the Wellcome Trust in London on 28 March. 35 international experts and practitioners took part, including academics and researchers from Harvard, Oxford and the LSHTM, representatives from the WHO, the Council of Europe, the British and French Health Ministries, leading NGOs, including the Institute for Research against Counterfeit Medicines and the Chirac Foundation, and specialists from Africa and the Middle East. The conference agreed that now was a crucial moment to tackle this issue which affects every country around the world but which in many low-income countries has become a grave public health crisis. It is particularly acute in sub-Saharan Africa where between 30% and 60% of the medicines in circulation are believed to be substandard or falsified. It needs to be a new global priority. Starting with the upcoming World Health Assembly in May 2018, but also the G20, the African Union, the Commonwealth and the UN General Assembly, we want to ensure that the drive to provide Universal Health Care (UHC) as a part of the 2030 Agenda for Sustainable Development means providing access to medicines but access to medicines that work. Failure to end the problem of substandard and falsified medicines will fatally undermine the goals of UHC . The agreement on working definitions at the 2017 World Health Assembly represents an important step forward. Disagreement on definitions and terminology can no longer be an excuse for inaction. Because the issues of substandard and falsified medicines are complex, more research and data are still critical to define the precise scale and nature of the problem. This is a multi-faceted problem. The policy solutions, including, improved regulation, stronger legal frameworks, stricter enforcement and tougher penalties, need to reflect this reality. Therefore, these are issues that will require the engagement of not only health ministries but also justice and interior ministries. The Council of Europe’s Medicrime Convention provides a model for the introduction of a criminal legal framework. However, because criminal activity is transnational, this framework needs to be adopted world-wide to be effective. So far only 12 countries have ratified the Convention. The extent of criminal involvement, especially transnational criminal networks, is an important area which remains under-researched. Innovative technologies, particularly in the rapid detection of substandard and falsified medicines, are becoming available and are an important part of the solution. We need to ensure that successful experiments are evaluated quickly and rapidly scaled up. A vigorous and effective global surveillance system is essential to understand the full dimensions of the problem. The new WHO system is a valuable start, but it suffers from massive under-reporting. We need to find new approaches to ensure better data and more systematic reporting. International concern about the growth in Antimicrobial Resistance (AMR) is a further reason for increasing the focus on ending the traffic in substandard and falsified medicines. Research to date has tended to focus on the supply side; more is now needed on the demand side. This means not only better consumer information but improved access to quality medicines – “medicines that work”. The Foundation is honoured that Mrs Pauline Latham OBE, MP, member of the House of Commons Committee on International Development, agreed to speak at the reception to mark the opening of the conference we helped to organise on substandard and falsified medicinese. At a meeting of the ad hoc co-ordination group held in Rabat on 12 March chaired by the Congolese Minister of the Environment and the Moroccan Minister of State for Sustainable Development, experts agreed on the terms of reference for a detailed, six month preparatory study. This will make recommendations on which the crucial decisions on the financing, the operational management and the strategic governance of the Congo Basin Blue Fund will be taken and draw up a first investment plan. The Brazzaville Foundation, which participated in the meeting, warmly welcomes this outcome which brings the Congo Basin Blue Fund, a concept originally devised by the Foundation, an important step closer to realisation. The Moroccan Minister of State for Sustainable Developmentvironment Nezha El Ouafi and the Congolese Minister of the Environment Arlette Soudan Nonault together with experts and focal points of the Congo Bassin including the representatives of the 4C and Sir David Richmond, the Chieg Executive of the Brazzaville Foundation. Jean-Yves Ollivier, le Président de la Fondation Brazzaville, donnera à Science Po Paris une conférence sur le thème "les enjeux de la diplomatie parrallèle" le mercredi 21 février 2018 à 19h15. La Fondation Brazzaville tient à remercier Sciences Po Paris ainsi que l’association Sciences Po Défense et Stratégie qui a organisé la conférence. The Brazzaville Foundation is honoured to welcome the Prime Minister Amama Mbabazi to its Advisory Board. Jean-Yves Ollivier, Chairman of the Brazzaville Foundation, said: “We are delighted that Amama Mbabazi, the distinguished Ugandan statesman, has agreed to join the Foundation’s Advisory Board“. Before becoming Prime Minister of Uganda (2011-2014), he held several Cabinet posts, including Minister of Defence, Minister of Security and Attorney General. As Minister of State for Foreign Affairs, he negotiated the Lusaka Peace Agreement that ended hostilities in the DRC, secured the withdrawal of foreign forces and re-established central government administration. He also represented Uganda in the IGAD mediation in the Sudan conflict. Among his many other positions, he is a founding member of the Uganda AIDS Commission (1990-1995) and chairman of the Board of Trustees of the Joint Clinical Research Centre which contributed to vaccine development and HIV care. The Brazzaville Foundation is joining Harvard University’s Global Health Institute to host a conference in London at the end of this year on the growing public health crisis caused by the proliferation of sub-standard and falsified medicines. This will bring together leading experts from around the world to discuss key issues, including strengthening legal and regulatory controls, greater international cooperation on enforcement and detection and better information campaigns, with the aim of developing new ideas and a shared agenda for tackling this crisis. During the ceremonies in Congo for the signature of the Memorandum of Understanding on the creation of the Congo Basin Blue Fund, the Brazzaville Foundation has launched a new initiative designed to raise awareness of the public health crisis caused by the rapidly growing traffic in counterfeit medicines. Promoting a dialogue between governments and the pharmaceutical industry to find a solution for all those who are forced to buy fake medicines because they do not have the means to buy real ones. The Brazzaville Foundation warmly welcomes the engagement of Cameroon. Ten countries have now signed the Memorandum of Understanding on the Congo Basin Blue Fund : Angola, Burundi, Cameroon, Central African Republica, Chad, Democratic Republic of Congo, Gabon, Republic of Congo, Rwanda and Morroco). 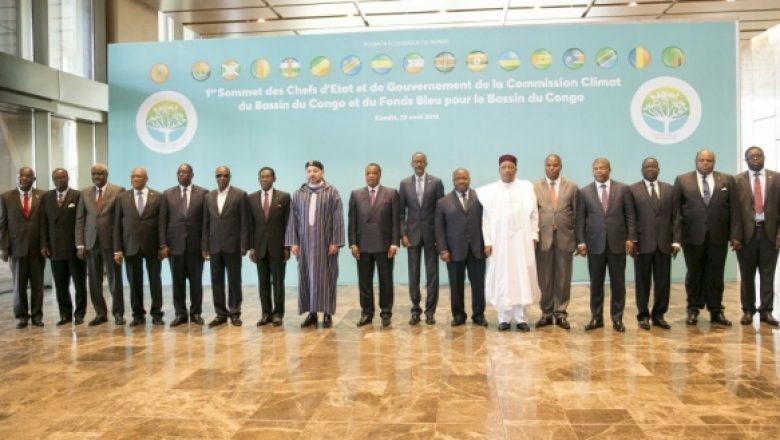 On 9 March 2017, at a Ministerial meeting at Oyo in the Republic of Congo on 9 March eight Central African countries (Angola, Burundi, Chad, the Central African Republic, the Democratic Republic of Congo, Gabon, the Republic of Congo and Rwanda) and Morocco, as President of COP 22, signed a Memorandum of Understanding in which they agreed to establish the Congo Basin Blue Fund. Much remains to be done to make the Blue Fund a reality but this was a crucial step forward. HRH Prince Michael of Kent, Patron of the Brazzaville Foundation and President Olusegun Obasanjo, member of the Brazzaville Foundation, with representatives of the ten countries that had agreed to establish the Congo Basin Blue Fund. The Congolese Minister of Environnement, Rosalie Matondo, with HRH Prince Michael of Kent, Patron of the Brazzaville Foundation, Cecilia Attias and Pär Stenbäck, members of the Advisory Board of the Foundation and Ilmas Futtehally and Fatima Bennina, Friends of the Foundation, at the Signature of the Memorandum of Understanding establishing the Congo Basin Blue Fund. The Brazzaville Foundation Brazzaville will be in Oyo, Congo, from 8 to 10 March for the official signature of the memorandum of understanding on the Congo Basin Blue Fund. On 22 November, in New York, The UN Security Council held a special open debate on “ Water, Peace and Security”. In his speech, Mr Danilo Türk, the Former President of Slovenia and the Chairman of this Global High Level Panel on Water and Peace, included a reference to the Congo Basin Blue Fund proposal and the importance of a political support for such initiatives. Sundeep Waslekar, a member of the Board of Advisers and President of the Strategic Foresight Group was also one of the principal speakers. The President of the Republic of Congo, in collaboration with the Brazzaville Foundation, has launched the creation of the Blue Fund Initiative for the Congo Basin during his official speech at the COP22 on 16 November in Marrakech. The Brazzaville Foundation is delighted to know that its Initiative became one one of the key points of the African Summit held in the margin of the COP 22. Du 25 au 27 avril 2016 s’est déroulée à Baku (Azerbaïdjan), la 7ème édition du Global Forum of the United Nations Alliance of Civilizations dont le thème central était « Living Together In Inclusive Societies : A Challenge and A Goal ». A cette occasion, la Fondation Brazzaville a été doublement représentée. Jean-Yves Ollivier, Président de la Fondation Brazzaville et Sundeep Waslekar, Président du Strategic Foresight group et membre du conseil consultatif de la Fondation Brazzaville ont participé en tant qu’experts, à l’atelier « Constructing Peace, Deconstructing Terror » co-organisé par le Strategic Foresight group. Le Strategic Foresight group est un think-tank indien qui conseille gouvernements et institutions sur les enjeux d’un monde globalisé (résolution de conflits, terrorisme, guerre de l’eau, prévisions économiques). Peut-on instaurer un véritable processus de dialogue entre les Etats-clés au Moyen-Orient et dans les autres parties du monde pour lutter contre l’extrémisme violent ? Un nouveau contrat social « global » pour les régions détruites par des conflits internes ou régionaux peut-il aider à réduire l’attrait vers les mouvances extrémistes ? Que doit-on faire pour restaurer le sens de la dignité auprès des populations se sentant marginalisées ? Comment peut-on passer des thématiques confessionnelles ou communautaristes aux thématiques économiques et stratégiques face à un extrémiste violent ? Le système international centré sur les Nations-Unis n’est pas totalement adapté à la mise en place de règles de droit dans la résolution des conflits. Il est nécessaire de revoir les structures institutionnelles des Nations-Unies, y compris le Conseil de sécurité. Il est aussi nécessaire pour tous les pays d’investir des ressources financières et humaines pour contribuer à l’action des Nations-Unies. Il est primordial d’établir un dialogue à différents niveaux, d’une part entre gouvernements et d’autre part entre acteurs non-étatiques. Cependant, pour que le dialogue soit constructif, il est essentiel de comprendre la position des différentes parties. Il est aussi important d’écouter le discours des parties adverses et de s’attaquer aux vecteurs « psychologiques » générant la violence. Le droit international et le dialogue peuvent ne pas fonctionner avec des organisations comme Daesh ou Boko Haram, lesquelles ne croient précisément pas en l’idée d’Etat et qui se présentent sous différentes formes dans plusieurs parties du monde. Pour négocier avec de telles organisations, il est essentiel de chercher à comprendre en amont et en profondeur leurs ressors. Une telle approche semble faire souvent défaut aujourd’hui. Pour voir l’intégralité des échanges, cliquez-ici. The Brazzaville Foundation is honored to welcome Jean-Paul Delevoye, Xavier Guerrand-Hermès and Pär Stenbäck in its Advisory board. Jean-Yves Ollivier, Chairman of the Brazzaville Foundation, declared “We are glad to have these three new members in our team. Their deep knowledge of diplomatic issues and international negotiation is a key asset for the Brazzaville Foundation”. Jean-Paul Delevoye is an expert in economic and territorial issues. He is a former minister, Mediator of the French Republic and President of the Economic, Social and Environmental Council. Xavier Guerrand-Hermès has a long-standing interest in interfaith dialogue and he is the Founder and Chairman of the Guerrand-Hermès Foundation for Peace. Pär Stenbäck completes his extensive knowledge of European policy issues with a deep experience acquired on the field, through his multiple humanitarian commitments. Becoming part of the Foundation’s Advisory board, they integrate a group of international experts in diplomacy, environmental protection and conflicts resolution. The Brazzaville Foundation is pleased to announce the signing of an agreement with The King Baudouin Foundation United States, Inc. The King Baudouin Foundation United States (KBFUS) enables U.S.-based donors to support their favorite causes and organizations overseas, and provides European and African nonprofits with cost-effective solutions to raise funds in the United States. The King Baudouin Foundation United States is associated with the Brussels-based King Baudouin Foundation, an independent, pluralistic foundation that aims to contribute in innovative and sustainable ways towards greater social justice, democracy and respect for diversity. Kabiné Komara, a former Prime Minister of Guinea and member of the Foundation’s Advisory Board, has been chosen to lead a 100-strong ECOWAS electoral team to observe the Presidential elections in Benin on 6 March. This is the third time he has been chosen to lead an electoral observation mission in West Africa, a tribute to his integrity and impartiality. When asked about the reasons of this thrice renewed confidence by La Voix de Guinée, he said : « I believe these successive choices are the result of the credibility of Guinea since the end of military transition and the establishment of a democratic regime under President Alpha Conde ». Kabiné Komara was also one of the lead speakers at a conference in Bamako on 18-20 February on “Africa – Between Chaos and Emergence ” in which he sounded the alarm about the risk of water shortages in the African continent becoming a future source of conflicts, particularly in the light of growing demographic pressures, if the right policies are not adopted. Sundeep Waslekar, President of Foresight Strategic Group, and Ilmas Futehally, CEO, recently invited Jean-Yves Ollivier to have an interactive session with key opinion makers in Mumbai including Mr Niranjan Rajadhyaksha (Executive Editor of Mint), Indrajit Gupta (CEO of Founding Fuel and founder Editor of Forbes India), Shaji Vikraman (Resident Editor of Indian Express), Anant Gadgil (Member of Legislative Council), D Shivanandan (former Director General of Police of Maharashtra) and Milind Bharambe (Joint Commissioner of Police of Mumbai City.) The exchange focussed on the comparison of Indian and Chinese engagement with Africa, his experiences in South Africa and the current issues in international politics. In his interaction with the SFG Research Analysts, Jean-Yves Ollivier introduced his philosophy that an individual can make significant contribution to positive change at national and international levels. The Strategic Foresight Group is a a think-tank based in India that advises governments and institutions around the world on managing future challenges (water diplomacy, terrorism, foresight for countries and societies). Sundeep Waslekar is President of Strategic Foresight Group and a member of The Brazzaville Foundation’s Advisory Council. The Brazzaville Foundation welcomes Cécilia Attias within its advisory board. “Cécilia Attias forged her experience of diplomacy at the highest level and managed to overcome very delicate situations with talent, notably during the Bulgarian nurses affair. Both her advice and contacts will be of great value to encourage foster pacific conflict resolution where the foundation is solicited” said Jean-Yves Ollivier, President of the Brazzaville Foundation. Born in France, Cécilia Attias studied law at the University of Paris Panthéon-Assas, before becoming a parliamentary assistant. She then occupied various positions within ministers’ offices, at the Assemblée Nationale and at Neuilly’s city hall. In 2007, as First Lady of France, Cécilia Attias managed to persuade Colonel Gadhafi to release five Bulgarian nurses and a Palestinian doctor imprisoned on Libya’s death row. To this end, she twice visited Tripoli. After having successfully negotiated the extradition of the prisoners to Bulgaria, she was awarded honorary citizenship of the Bulgarian capital, Sofia. Cécilia Attias now lives in New York where she works as Vice President of Public Affairs at Richard Attias & Associates, part of WPP, the world’s largest communications services group. In this position, she has been working for several governments in the definition of their positioning and influence strategy. She is also President and Founder of the Cécilia Attias Foundation for Women which aims to be a guiding force in fostering positive change for women across the globe. The Brazzaville Foundation warmly welcomes the decision by the Republic of Congo on 30 December 2015 to join the Elephant Protection Initiative, the 11th African country to do so. This inter-governmental initiative is designed to save the African elephant by stopping the trade in ivory and is being promoted by the independent NGO Stop Ivory, with the support of the Brazzaville Foundation. A special three day conference was organized in the Austrian capital from the 22nd to the 25th October 2015 to mark the 200th anniversary of the Congress of Vienna. The conference addressed issues affecting global stability and how to establish principles for a stable world order. The Brazzaville Foundation was represented by our Chairman, Jean-Yves Ollivier, and Advisory Board member, Mathews Phosa. The conference was organised by the Chumir Foundation for Ethics in Leadership, in collaboration with a number of leading policy organisations and universities, as part of a 12-16 month project to address contemporary issues affecting global stability. In addition to the “Congress of Vienna 2015”, the project involves a series of international workshops and conferences; publishing policy papers; and preparing a report on the discussions at Vienna to be presented at a public session of the United Nations in New York at the end of February 2016. The keynote address was given by Romano Prodi, former Prime Minister of Italy and former President of the EU Commission. The conference brought together some 40 leading global thinkers, former government and international organisation representatives, leading businessmen and representatives of civil society to discuss these international challenges. Jean-Yves Ollivier made an intervention on the importance of conflict resolution in tackling the root causes of forced migration. His address was particularly well received by the conference participants. During the Congress of Vienna, the representatives of the Brazzaville Foundation had the opportunity to talk with numerous leading global thinkers, including the Canadian businessman Joel Bell, who is the Chairman of the Chumir Foundation, HRH Prince Hassan of Jordan who takes a close interest in the forced migration issue, the Austrian diplomat Wolfgang Petritsch who was involved in conflict resolution in the Balkans, and Bakhtiar Amin, a former Iraqi Minister who was particularly interested in the Foundation’s discreet approach to confidence-building and reducing tensions between conflicting parties. For the very first time, members of the Brazzaville Foundation met in London the 8th and 9th of SeptemberComing from all over the world, they broke the ice dining at London’s oldest restaurant, Rules. The next day, the first advisory board took place at the Royal Automobile Club where the lunch was served afterwards. This work session was the occasion to broach different discussion points and to formalize the Foundation’s creation. This two-day reunion ended with an official diner hosted at the Chamber of Lords, gathering the Foundation members and having London’s bishop, Lord Lothian and Michael Binyon from the Times as prestigious guests. On Wednesday, June 17th 2015, the president of the Brazzaville Foundation, Jean-Yves Ollivier, received the Legion of Honor from the French Prime minister Manuel Valls. Known as an expert in international business concerning raw materials, Jean-Yves Ollivier played a key role, on September 7th 1987, regarding the release, on the tarmac at Maputo Airport (Mozambique), of 133 Angolan soldiers and about fifty fighters for the independence of Namibia in exchange for the South African Captain Wynand Du Tout, caught two years before in Angola. After that, he helped for negotiating and signing the Brazzaville Agreement, which paved the way for the end of apartheid and the release of Nelson Mandela, on February 11th 1990. The private secretary of the prince of Kent, the British ambassador and several African ambassadors attended the ceremony. Plot For Peace – the documentary which recounts the story of the “conspiracy” that led to the release of Nelson Mandela and in which Jean-Yves Ollivier, aka “Mr. Jacques,” played a key role – was screened May 26, 2015 at the United Nations Headquarters. Many UN diplomats and personalities were present at the projection as the ambassadors Ismael Gaspar A. Martin, François Balumuene Mamadou Tangara and Caleb Otto, respectively permanent representatives of the republics of Angola, Congo, Gambia and Palau to UN and Pierre Oba, the Minister of Mines and Geology of the Republic of Congo. This projection was part of the United Nations World Africa Week. Following the projection, The United Nations added Plot for Peace to its official archives.